It was in July, 1759 when the master shipwright of the Chatham England dockyard received a letter to "make preparation and to prepare costing for a first-Rate Ship of 100 guns, to be built and fitted for sea." According to custom, seven names were reserved for First Rate ships and Victory was the only name not in use at the time. In 1760 Victory was chosen for the new ship. The last Victory had been lost with all hands on board so there were some doubts about the use of that name. The first Victory was launched in 1559 and was the flagship of Sir John Hawkins. This Victory, designed by Thomas Slade, was the fifth ship of the royal Navy to bear this name. The Chatham Dockyard had but a single dock, and in July 23 1759 on a bright and sunny day, the keel was laid for the HMSVictory. Timbers for this type ship were seasoned for 14 years before use; many think this is one of the reasons for her strength and longevity. The Victory is a classic example of warship construction that was used by all maritime powers of that era, including Denmark, France, Holland and Spain. In May 1763, the Victory was floated out of the Chatham dock to be ballasted; she had a starboard list that took thirty-four tons of shingle ballast to correct. 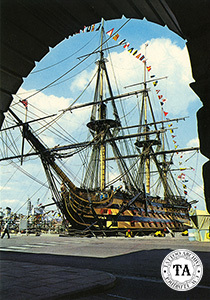 The HMSVictory languished in reserve until France joined the war of American Independence in 1776. She was then was ordered to be completed and commissioned for sea service and on April 13, 1778 she made sail for the first time. After the Battle of Trafalgar in 1805 where the French war fleet was routed by Lord Nelson's fleet, the Victory was badly damaged and was towed first to Gibraltar and then to Portsmouth for repairs. Lord Nelson was killed in that battle and his body was transported back to England on his damaged flagship. 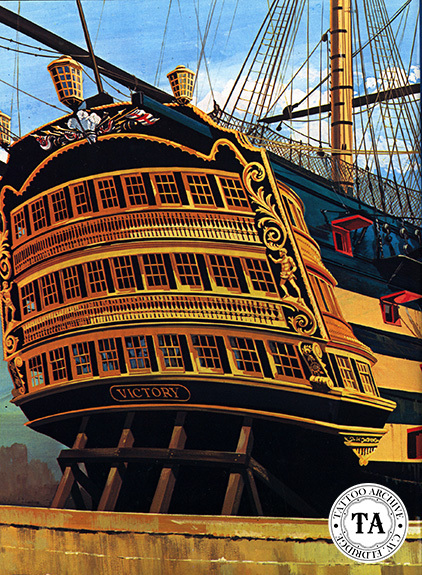 Several refits later in 1831, the HMS Victory was listed for disposal, but the warrant wasn't signed and she was moved back into the reserves. The stories of the great sailing ships of the world are always fun to relive, but for Skin & Ink we need the tattoo connection. For the HMS Victory, that connection is none other than the famed London tattooist George Burchett. In Burchett's book, Memoirs of a Tattooist, he talks about sailing on the Victory in 1888 when he was but 16 years old. Following is an excerpt from the memoir, "In the meantime, many of the old ships were being reconditioned, among them HMS Victory. After 10,000 pound worth of work she was pronounced watertight once again, and Boy George Burchett-Davis was transferred to her as she lay at her moorings in Portsmouth Harbour in October 1888. For the next three years she was my home on a world tour similar to those enjoyed by all sailors in this era, when the Navy had ships instead of offices." Burchett tattooed, or as he described it "scratched", while he was on the Victory. On the cruise Hori Chyo, who at that time was considered one of the greatest tattooists in the world, tattooed Burchett. The HMS Victory was built and sailed during a time when Britain ruled the seas and is the only surviving warship that fought in the American War of Independence, the French Revolutionary War and the Napoleonic Wars. The English make pilgrimages to HMS Victory as Americans do to the USS Constition. The HMS Victory was put into her present dock at Portsmouth, England in January 1922 and work began to restore her to her 1805 appearance. She is open today for visitors and it is well worth a side trip to Portsmouth to see her on your next trip to the UK.